GOME-2 aerosol index on November 9th, 2017. 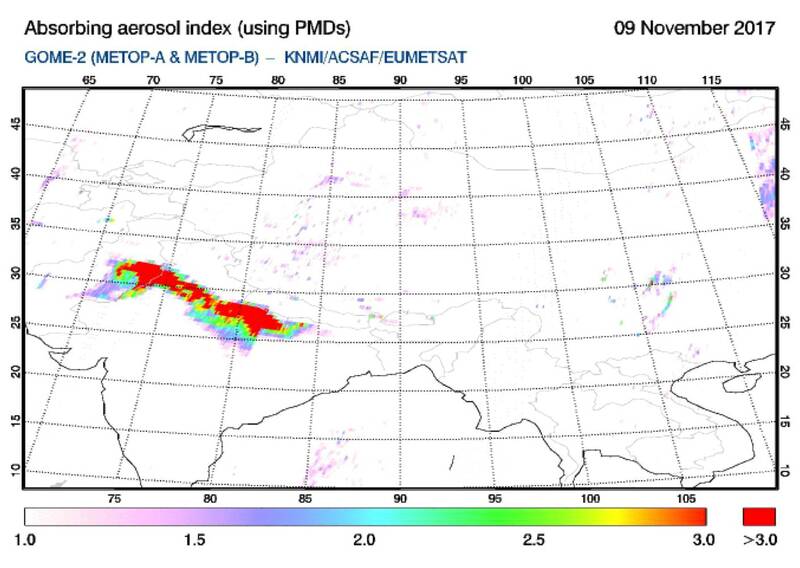 Red colours indicate extremely high concentrations of particulate matter in the atmosphere over northern India. Almost at the same time, a new Nature paper by our Nasa colleagues came out with the title “India Is Overtaking China as the World’s Largest Emitter of Anthropogenic Sulfur Dioxide“. 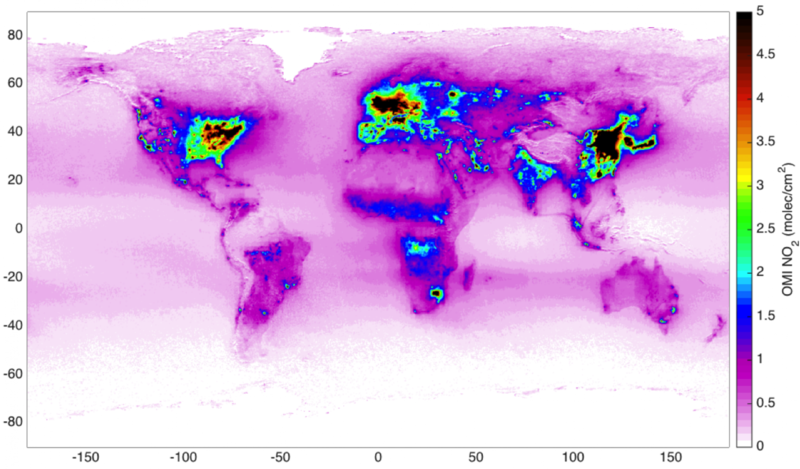 Their results are based on OMI SO2 observations and on the emission estimation based on such satellite data. SO2 (sulfur dioxide) is an air pollutant typically produced when coal is burned to generate electricity and it is found in high concentrations close to power plants, smelters and refineries. They found that sulfur dioxide emissions increased by 50% in India, while they fell by 75% in China over the last decade. I think these results really put things into perspective. While this specific episode of smog is occurring during the crop burning season, it is worth stressing the context in which this is happening. Have a look at the global SO2 maps for 2005 and 2016 below, and try to find the differences (be careful though, some of them are volcanoes!). You will see that, according to OMI satellite data, air polluting emissions decreased dramatically in USA and Europe and recently also in China, while growing in India, as a result of the increasing amount of coal burning power plant installed in the country. OMI SO2 concentrations in the lower levels of the atmosphere in 2005 and 2016. High values are in green-yellow-red-black while low in white-blue colours. This is a gigantic wake up call. It reminds us how crucial the environmental protection policies are and that they should not be taken for granted.